Car Lockout Prevention Tips | Auto Locksmith Services | Call Now! Find out how to never lock your keys in your car again with these useful car lockout prevention tips. It happens to the best of us. We get easily distracted by text messages, the kids jumping in the backseat, or the next errands we need to run. We don't even realize how our cars get inside the garage half the time. Or how we've managed to leave the key in the ignition and close the automatic lock door behind us. One thing is for sure: when keys get accidentally locked inside the car for one reason or the other, we turn into helpless witnesses of our own tragedies. If small kids or pets get caught in the middle, the sinking feeling of despair is even more acute. When confronted with such a scenario and you fear your child is in immediate danger, your best bet is to call 911. If you have a spare key you can access in a timely manner, ask someone to bring it to you. If, on the other hand, no one has remained locked inside the car, but you cannot personally unlock your vehicle, call a locksmith nearby. The Get Locksmith team is ready to cater to your every lockout need, no matter what kind of a vehicle you might be driving. Give us a call and we will send over our nearest technician that will reach you within 20 minutes. For those of you looking for tips on how to avoid getting locked out a vehicle, these next few tips should come in handy. Only use your key fob to lock your vehicle, especially if you are using a set of keys with a built-in locking mechanism. Remember to always use the lock/unlock button on the fob every time you need to get in and out of your car. This way, you will always be forced to have your keys on you, which means you will never (or rarely) deal with a lockout. Always check and make sure that you have grabbed your keys in your hand prior to setting foot out of your vehicle. You may be also dealing with a dead car battery. Test the theory by inserting the key in the lock instead of using the fob. We use our smartphones to control the locks on our doors, count the calories we burn throughout the day, or issue reminders to drink our daily intake of water. So why wouldn't we use them as tools to help us avoid losing our car keys? Yes, there are apps that let you do just that. And there are also specialized gadgets that have been designed with this purpose in mind. Browse the internet or visit your local hardware/gadget stores and you will come across a number of different models. Some feature alarms and beepers that can be controlled via smartphone apps. Others will require the use of a distinct remote control. Depending on your exact needs and budget size, you can opt for more or less advanced solutions that should help you track down your car keys at all times. No missing key means no risk of a lockout, so consider getting the extra help. Most people deal with car lockout issues because they drop their keys in random places while getting distracted by something else. To make sure you never leave your keys behind again, whether at home, at work, or while having lunch at a local restaurant, make a habit out of using a pouch or a hook for storage. You can also use a special case for keys, or find a way to attach them to your handbag, belt, or anything else you carry on you all the time. You can also try to also keep your keys next to your phone, or look for a bulky key chain that is difficult to lose because of the loud sound it will make when dropped on the ground. While having a spare car key done might not actually prevent a lockout on itself, it will save you from a lot of headaches in the event of a lockout occurring. 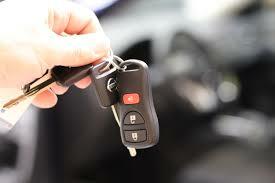 A local locksmith should have no problem duplicating any type of keys for any make or model of a car. Just make sure you find a safe storage space for the spares – be it inside your home, at the office, if you spend a lot of time there, or with a reliable friend or neighbor. While this might not be an actual measure to prevent locking keys in the car, it is one of the quickest, most efficient means of regaining access to your vehicle in case of emergency. A licensed, experienced, nearby lock technician that handles automotive services should be available 24/7. Get Locksmith has a well-trained, specialized emergency locksmiths that works at a nationwide level we are readily available to cater to your every lockout emergency need. We can reach you within 20 minutes from placing a call and get you back on the road on no time, hassle-free, and at some of the most affordable prices possible.